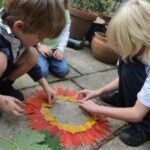 Well, this Kids Get Arty project, was driven by Red Ted’s homework – he was “doing” Paul Klee at school, which came in rather handy for our Kids Get Arty session. I love Paul Klee myself (his Red and White Domes where one of the first “Art posters” I owned as a Teenager), I thought that all the patterns and colours he uses would really appeal to the children – Red Ted in particularly. I also thought it would be a great opportunity to try out different mediums and bring them together. 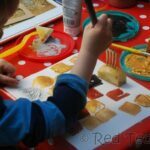 This arty session ended up as a session of exploration and we tried out different things as we went along. 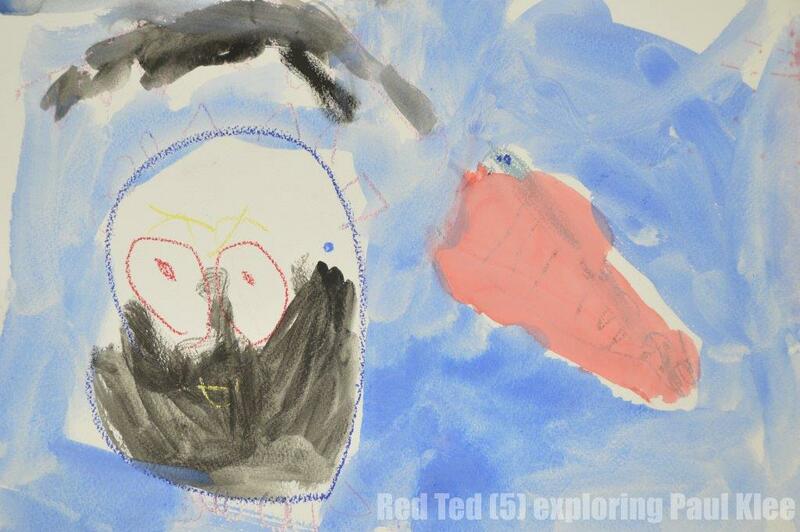 As per our other Kids Get Arty projects, I asked Red Ted lots of questions – about the picture – what do you think it is about? What do you think it means? What do you like about it? What can you find? What can you see? What shapes are there? What colours? Which picture do you like best? How does it make you feel? I confess, that compared to some or our previous projects, he was less than enthusiastic – maybe because this time it was part of his homework? I am not sure! We persevered and I think it was Pip Squeak who really enjoyed this art session. 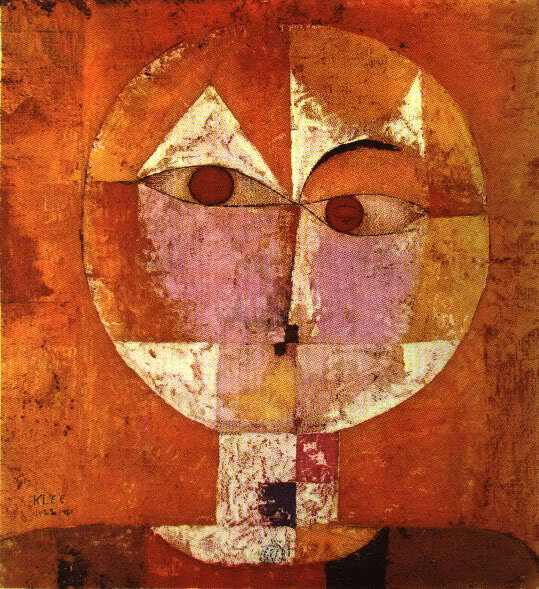 Paul Klee (1879-1940) was a Swiss-German. He created many of his paintings at home on his kitchen table, which is why they are all relatively small. He is now considered one of the most inventive artist of the 20th Century. Paul Klee loved experimenting and exploring colours and loved using colour to express how he felt or tell a story in his paintings. 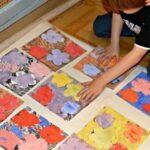 He loved using watercolours, but tried out all sorts of different mediums – oil paints, ink, pastels, pen, etching – often combining them to see how they worked together. 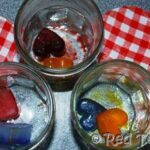 He love to experiment and was very inventive in his work (this bit rather appealed to Red Ted!). 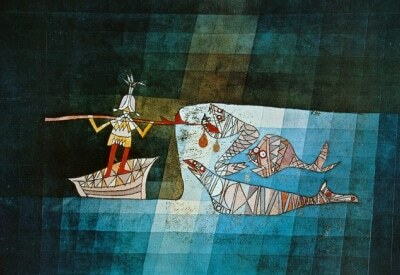 Paul Klee was also very musical. I helped Pip Squeak with her circles, Red Ted did his own. Then I wet the paper for them to help the water colours mix. 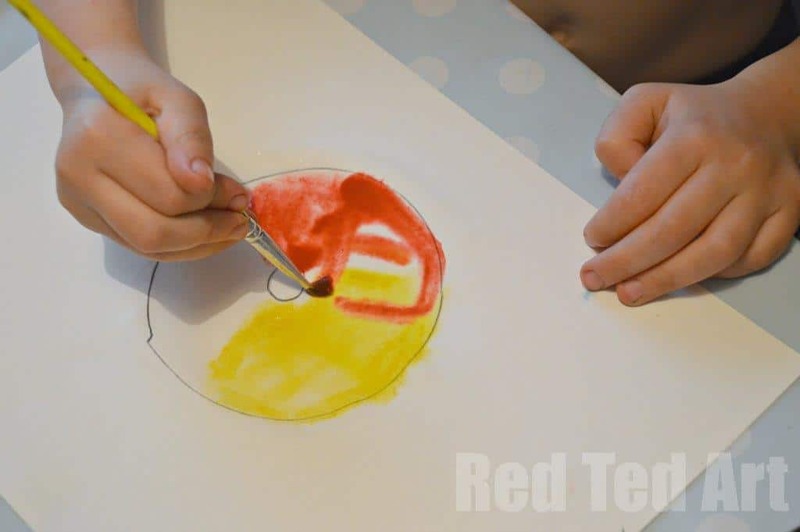 The children ONLY used red, yellow and blue from their water colour pallet. I did have to help Pip Squeak a little to get the colours blending a little on paper. She then wanted to do a “black center” and also added a little man at the bottom of her work! 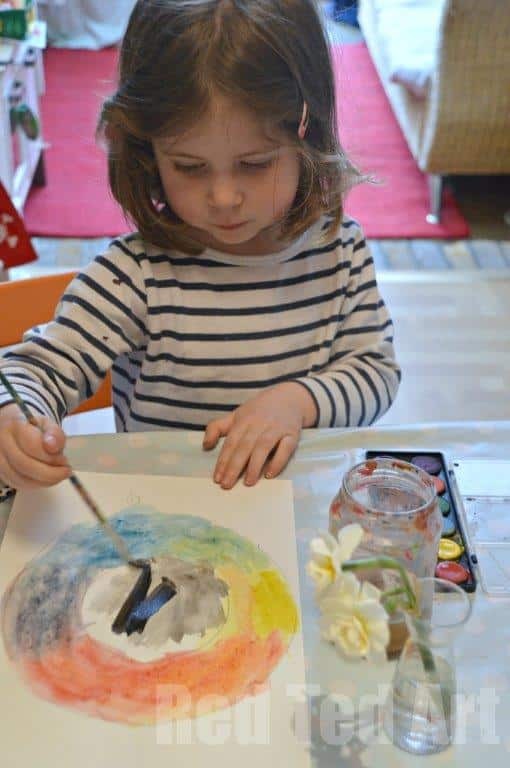 It was great practice in using watercolours too – we do get them out every so often, but the children had to practice to load the brush properly with pigments and were still learning that “adding lots of pressure” to the brush to do so, wasn’t necessarily the best way of doing it. 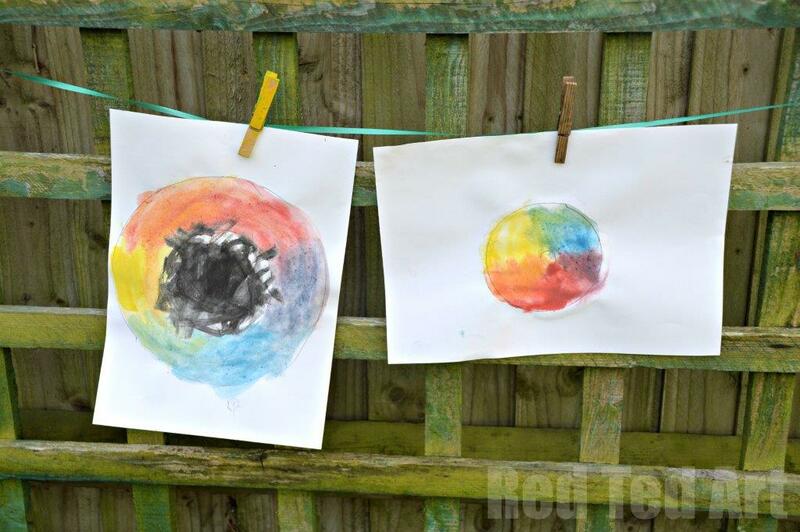 Don’t you just love how the same art activity results in such different results?! We then looked at Paul Klee’s pictures again. And had several different goes at them. My favourite by far (mainly because of Pip Squeak’s enthusiams) was her go at “faces” (or Senecio shared above). 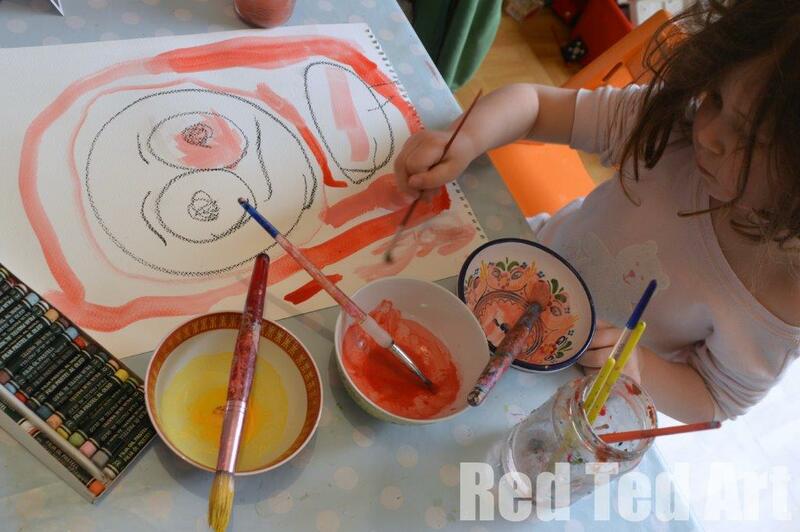 We used tempera paint, instead of watercolours, as the “large sheet of paper” was intimidating to Red Ted. A shame though, as the effect of oil pastels and water colours are far more striking than oil pastels and tempera paints! Pip Squeak ADORED having a go. She even stood up on her chair for a lot of her painting to really reach out. I think it was a great experience for her and Paul Klee’s “child like” art really appealed to her. She had great fun with this session and it was wonderful to paint and draw and use large pieces of good quality paper. Red Ted, worked on his more reluctantly. 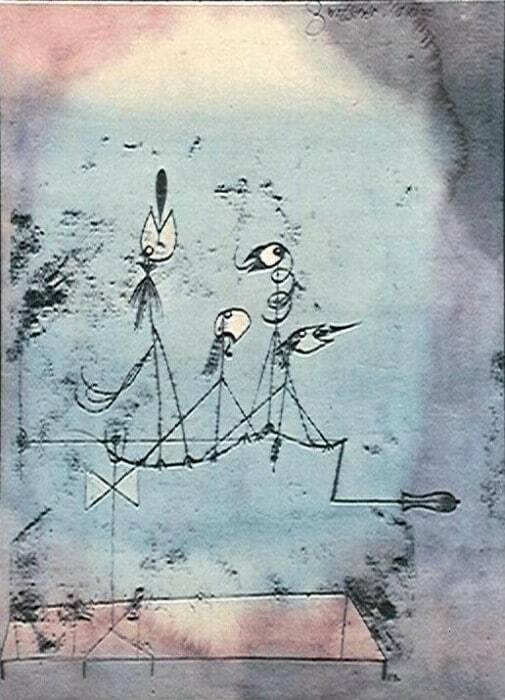 But interestingly incorporated details from different pieces of Paul Klee art – on the right you have one of the fish, whilst on the left a “Paul Klee Face”. 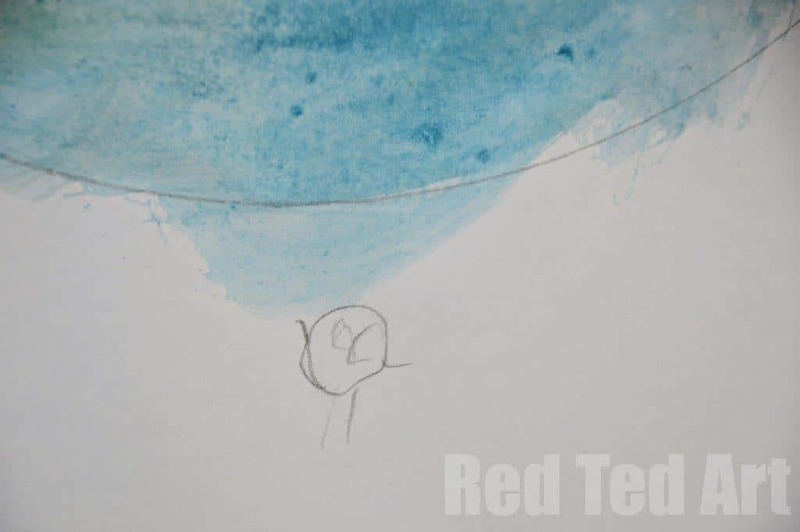 I think Red Ted’s art would have benefited from focusing on water colours, as they would have worked better with the oil pastels, but he was frustrated by the “slow progress” of water colour on such a large sheet of paper. I still think it was a valuable experience in different mediums and it has made me think about using “big pieces of paper” more with him. So.. now it is your chance! We would love to see what Great Artists you have been exploring with your kids and how you approached your arty projects! Come link up. 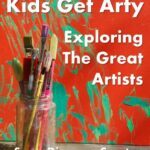 Kids Get Arty is co-hosted with Mom to 2 Posh Lil Divas. 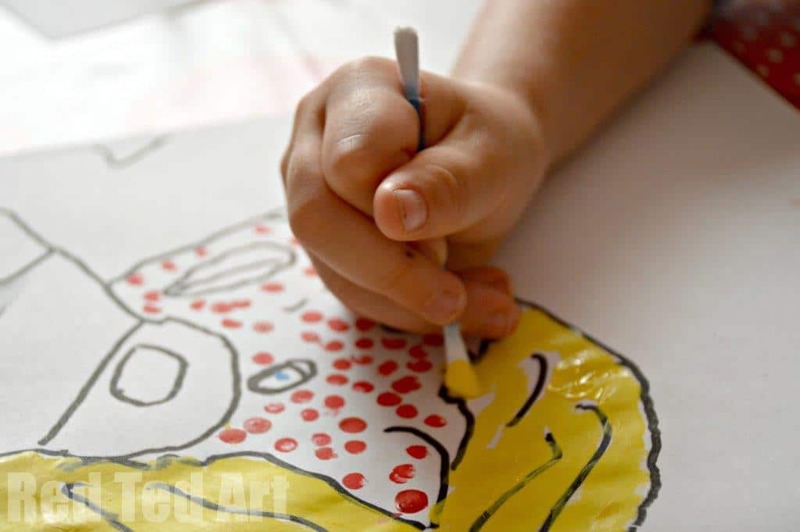 Disclaimer: by joining the Kids Get Arty linky – you give us permission to highlight any projects on Red Ted Art or share your art ideas on Pintrest – we will always link to your site! 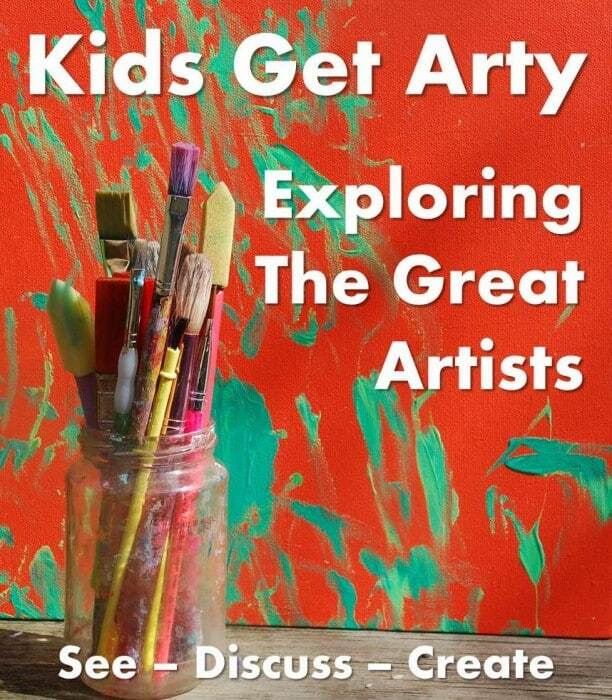 If you have been arty with your kid’s please link up! 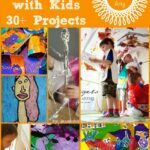 I can’t wait to see what Art Projects for Kids you did! I love how the colour wheels in particular came out. I’m impressed at how clear their colour blending is! I know, I think it was a great lesson for them to see that you can really create new colours on paper. We did need lots of water though and repeated adding of water colour to get to it! 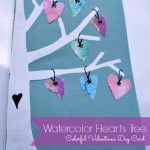 Love this post – and love what your little created using Klee as inspiration. Thanks for hosting the linky. I hadn’t thought to start colour wheels so young but they look really great. It is the first time we have actually done a colour “wheel”… but we have been doing colour theory for ever – every time we mix colours, I ask them how you get new ones. And we loved mixing colours to make our Rainbow Cookies. Never too early!! I love this series : ) I have to confess to a big soft spot still for the Animal Hand Prints though! Waiting for the animal foot prints????? Hehehe I need to muster the energy for the footprints!! I love how they each interpreted him in their own way. Those Klee-like faces are just precious! I have tons of art experiments, but I’ve never thought of actually teaching about fine art while doing free time art! What a great idea. Thanks for the post!